This tutorial shows how to deploy a Network Service Record composed by 5 VNFs, a basic OpenIMSCore. You can execute also the same tutorial using the TOSCA definitions. Compared to the Iperf-Server - Iperf-Client the example provided here is far more complex. So we assume you are fimiliar with the architecture. Upload a VimInstance to the NFVO (e.g. this VimInstance). 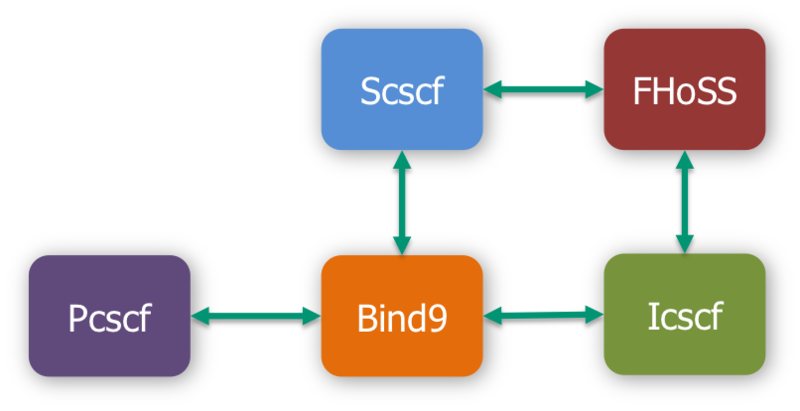 Download the necessary files from the github repository and pack the VNF Packages for all 5 components ( scscf, icscf, pcscf, bind9, fhoss ). For this example we assume the network used to interconnect the components is called "mgmt", if you want to modify this example ensure you are naming the network accordingly, the scripts from the github do not handle different network names yet. Also the vimInstanceName may be different to you, depending on your setup. The deployment_flavor is optional but should containg enough RAM for the default configuration of the components to be able to run, else some components may crash on start. This example setup has been successfuly tested on clean Ubuntu14.04 images with 2048 Mb RAM deployed on an Openstack Kilo (2015.1.3). Ensure that the image name defined in the Metadata.yaml of each package is existing. Download the following NSD and upload it to the NFVO either using the dashboard or the cli. Take care to replace the vnfd ids with the ones you deployed. Open the Dashboard (checkout the dashboard documentation) for more information on how to use it), open it at the URL http://your-ip-here:8080 and log in (default username and password are admin and openbaton). Go to Catalogue -> NS Descriptors and choose the NSD of your choice by clicking on On Board NSD -> Upload JSON and selecting the Descriptor's json file. Deploy the stored NSD either using the dashboard. You need to go again to the GUI, go to Catalogue -> NS Descriptors, and open the drop down menu by clicking on Action. Afterwards you need to press the Launch button in order to start the deployment of this NSD. If you go to Orchestrate NS -> NS Records in the menu on the left side, you can follow the deployment process and check the current status of the deploying NSD. Once the Network Service Record went to "ACTIVE" your OpenIMSCore - Bind9 - FHoSS deployment is finished. For Benchmarking we can use IMS Bench SIPp but then you should add more users to the FHoSS database since by default it only contains 2 users.